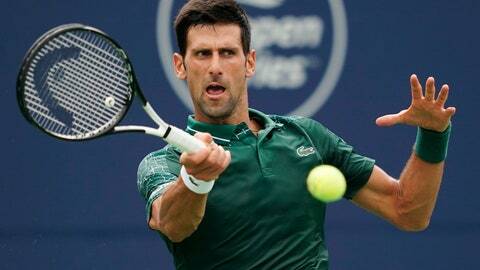 TORONTO (AP) — Four-time champion Novak Djokovic advanced to the third round of the Rogers Cup on Wednesday, defeating Canadian wild card Peter Polansky 6-3, 6-4. Djokovic, coming off his fourth Wimbledon title last month, fired seven aces and never faced a break point in the 1-hour, 25-minute match. It was only the second time the two veteran players had met and the first in nine years. Djokovic beat Polansky at a Rogers Cup in 2009. Heavy morning rain delayed the match by about an hour. Milos Raonic of Canada was scheduled to follow Djokovic’s win on center court, but that match was delayed by rain. Top seed Rafael Nadal of Spain had the prime court to open the evening session. Earlier Wednesday, tournament officials announced that Juan Martin del Potro of Argentina had withdrawn from the Rogers Cup with a left wrist injury. Polansky, a 30-year-old from nearby Thornhill, Ontario, reached a career-high No. 110 in June but entered the week at No. 121. Canada’s Daniel Nestor, the oldest player at the tournament at 45, was scheduled to play a first-round doubles match in the late afternoon. Nestor is retiring following the Davis Cup in September. He will have played in 30 Rogers Cups since his first as a 16-year-old wild card in 1989.